SIIG's Full HD Multi-Channel Expandable Wireless HDMI Gateway Extender Kit - Mid Range is designed to extend HDMI audio/video signals wirelessly up to 165ft from three HDMI source devices to a remote display in line-of-sight environment. Full HD 1080p resolution is supported to deliver crystal clear images and videos. 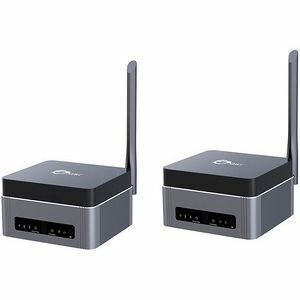 Powerful 5GHz wireless transmission makes broadcasting HD multimedia contents clean and tidy without running lengthy cable between the device and the display. This HD Multi-Channel Wireless HDMI Extender Kit is expandable to allow a 2nd receiver unit (CE-H22U11-S1 sold separately) to be added to receive media contents from the existing transmitter unit of the kit. It enables you to choose and broadcast contents from any of the 3 source devices to any of the 2 displays simultaneously. Up to ten wireless channels are available to accommodate the added receiver for signal interference prevention and optimal reception quality. It also offers a HDMI local display output for monitoring function to ensure High Definition digital signals are transmitted to the remote locations. It is simple plug-n-play to setup with no software installation required. Easy and convenient to use IR (infrared) controller is provided to remotely control the media devices from the display location. Make changing channels, pausing/restarting program or switching input source super easy to navigate. This is a superb HDMI Extender solution for home entertainment, retails, restaurants, classrooms, showrooms and many other venues to wirelessly stream HD media contents from Cable/Satellite box, Blu-ray player, game console or PC to the remote displays without the cost of cabling and wire installation.